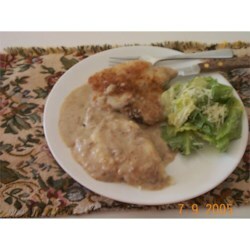 "This is a very comforting, satisfying dish, and makes a great meal when served with rice or mashed potatoes and a tossed salad." Combine bread crumbs and Parmesan cheese in a large resealable plastic bag. Add chops two at a time, and shake to coat. Heat oil in a large skillet over medium-high heat, and cook chops until brown on both sides. Remove chops from skillet, and reduce heat to medium. Blend soup and milk in the skillet, stirring to scrape up the bits of breading left over from the chops. You can adjust the amount of milk depending on how thick you want the gravy to be (it will thin a bit during the cooking process). Bring to a gentle boil, increasing heat slightly if necessary. When soup mixture is bubbling, return chops to skillet. Cover, and reduce heat to low. Simmer for 20 minutes, or until chops are cooked through. Oh wow! We just had it for dinner wish biscuits and mashed potatos. I sauted an onion and garlic before browning the porkchops. I used a cup of milk for extra gravy. Very easy to make and very tasty. My chops came out tender and moist. I did add some garlic powder and pepper to the bread crumbs. I recommend this one highly! This recipe was really very average. Nothing bad about it, but nothing exciting either. When you add this to the fact that my breading got soggy I will not make again.